James Kaagegaabaw Vukelich has been recognized as a leading voice in Native Language revitalization efforts and spiritual teachings for over a decade. His keen insights on the interconnectedness of language and culture were developed in the field speaking with and recording elders and native speakers of the language (many of whom have since passed on) in Canada, Michigan and Minnesota as part of the Ojibwe Language Dictionary Project. What truly sets him apart is his ability to move seamlessly through diverse educational and community settings with both his curriculum development and presentations. James has consulted with multiple school districts to develop and teach language and cultural programs at all levels from pre-K through college. It's not uncommon to find him working with young children one afternoon and the next mentoring teachers on how to incorporate language into their classrooms. 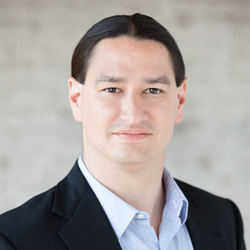 Beyond educational settings, he has facilitated multiple language roundtable groups and conducted spiritual ceremonies in communities throughout the Twin Cities as well addressing broader audiences at Native conferences across the United States. When he is not speaking, teaching or traveling, James enjoys spending time with his wife and boxer dogs in South Minneapolis.